Sweet Purrfections: Is This Water Tastier? Truffle and Brulee have 3 pet fountains throughout the house. So how come Truffle prefers drinking out of my new Gamecock cup? I admit, I drink more water now since this cup keeps the water cold. Every time I put it down, though, Truffle wants a sip. Around here, what Truffle wants, Truffle gets. Does your cat or dog get enough water each day? Disclosure: We received some of the fountains shown below from PetSafe® and posted reviews in the past. PetSafe is not responsible for the contents of this post. All opinions are our own. We only share products we believe in. We do want to remind everyone about the importance of providing enough water for your fur children. Did you know your pet needs 1 ounce of water for every pound of body weight daily? Cats are notorious for not drinking enough water. How can you ensure your cat drinks enough water each day? Make sure it's fresh, feed them canned food for moisture, and provide pet fountains to encourage them to drink. We have 3 fountains throughout our house and Mom Paula has placed them in a location where she can watch to see if we are drinking water. Two of our fountains have flowing streams we can drink from and one cascades down a slope. Brulee used to only drink from the bowl but now that we have a variety of fountains, she can be seen drinking from the stream. Truffle prefers drinking from a stream of water, such as the streams in the PetSafe® Drinkwell® 360 Multi Pet Stainless Steel Fountain. Mom Paula keeps this fountain in front of the AC vent in the spring, summer and fall so our water will stay cool. Mom Paula was pleasantly surprised recently when she looked over and saw Brulee drinking from the stream with her cute little flat face. 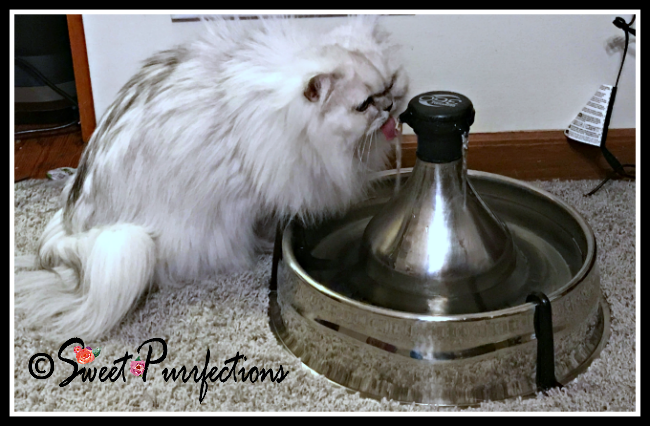 Brulee's favorite fountain is the PetSafe® Drinkwell® Sedona Pet Fountain. Mom Paula keeps this fountain in the bedroom because it's quiet and it's right beside her bed so she can monitor our intake. Each morning we get a treat (they are kept in her night stand) and after eating our treats, we jump off the bed and get a drink of water. It's important to keep the fountains or bowls cleaned on a regular basis to avoid a build up of bacteria. Cats like fresh water and dirty water could discourage them from drinking. We always like to share this video of Truffle exploring her PetSafe® Drinkwell Platinum® Pet Fountain. She was only a few months old and had lived with Mom Paula a few days. She was so funny learning how to drink from a stream of water because she had a fountain where the water flowed over an incline and didn't have a stream. The video is a little long, but if you have time, we'd like to encourage you to watch this in it's entirety to laugh at Truffle's antics. Please excuse the sports show in the background - Mom Paula had to act quick to get the video when this happened and didn't have time to turn off the TV sound. You can see other pet fountains by visiting PetSafe®. We can't wait to share a new fountain with you just in time for the holidays! Hahahaha. Time to buy another cup for yourself :) Just kidding ... I'm sure a big reason why she loves it so much is because it's yours! 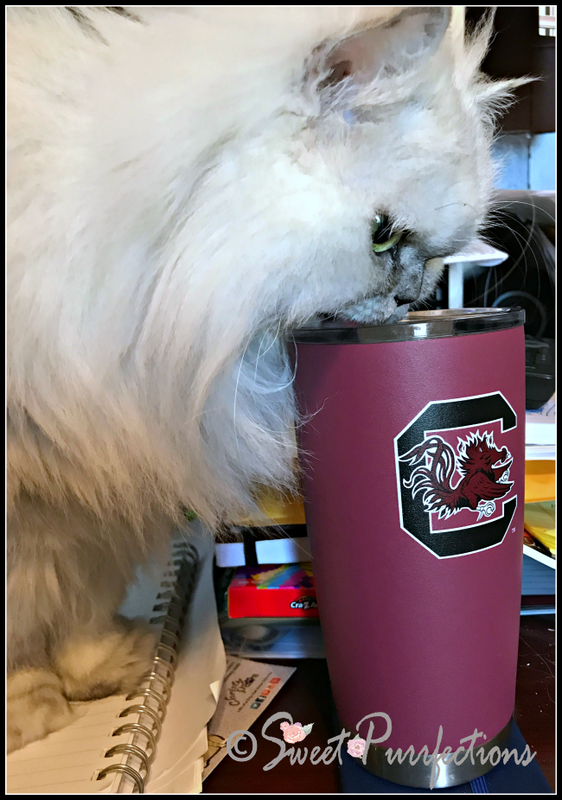 Yes, maybe Truffle needs her own Gamecocks cup! Truffle is such a character! The video is so cute, she's sticking her adorable little face into the water trying to figure it out. Icy loves drinking from streaming or pouring water too. These fountains are so pretty, I wouldn't mind having them around the house! My cat, Peanut Butter, turns up her nose at water in a bowl unless I've recently filled it and added an ice cube or two. I'll have to try the fountain to see if she would prefer that. I only have roim for one fountain in my apt so I need to make sure it fits both their needs. Lexy likes a stream and Lola likes drinking from the reservoir. These are pretty clever! I need giant ones lol! BOL - don't they always want what we have? That fountain looks great! Thank you for the reminders. a clean bowl with fresh cool water is a must around our furbabies always. We have a large pet fountain for Gonzo and Beau and during summer I bring extra bowls outside for them as well. Keeping hydrated is so important! Although lately I've had to protect my tea, Beau keeps trying to drink it! Probably because it's mine. How funny, maybe she is trying to show her school spirit! I think my cat would like a fountain, but he has never shown a desire to drink out of our cups. Jasmine preferred "tarp water" over anything we could offer. Cookie is pretty picky too; happy to drink at home but won't drink anywhere else. Manna and Dexter both prefer to drink from my glass too! I guess great kitties think alike. :) We have the Sedona fountain and Dexter really loves it. Pet fountains are a great investment. Truffle, I believe you were washing your fluffy head in that video! You are a smile-bringer for sure! Happy-Go-Doodle Chloe loves lapping up running water, too! How true - my cats all elect to drink differently. Some out of bowels, some from the faucet. Maybe the fountain would be a solution. Truffle is so cute and funny. Kilo the Pug is also very fussy about water and asks for his bowl to be refreshed twice daily. I tried a fountain and he loved it for a day but then went back to the bowl. I give him water with breakfast and dinner.